PORTLAND NSW - "Places of Interest"
Just over the Blue Mountains, Portland is an easy destination for a day trip from Sydney or a weekend getaway. Many hard to find artefacts can be found in the old wares shops and galleries in Portland and the The Glen (Charlie Pinch) Museum which contains a large collection of Australian memorabilia worth exploring. The Glen Museum was founded by The Late Charlie Pinch and his partner The Late Valerie Risby. Over the years Charlie has found and was donated collectables that he and his partner refurbished. And as the years went by the collections has grown. There is a lot of collectables and nic nacs, anything from industrial, gardening, kitchen supplies and electronics, bedroom furniture, hospital equipment and the original Band Hall, musical instruments and trophies from Portland. You can find something as small as a cup to as big as an industrial metal lathe. Presently The Glen is run and maintained by the relatives of Charlie and Valerie and by committee. The Glen is a non-profit organisation, at the end of the tour you can feel free to sign our guestbook in the phone booth and there is a donation box next to the guestbook. All donations go to the care and maintenance of the museum and to care for the animals that live there. 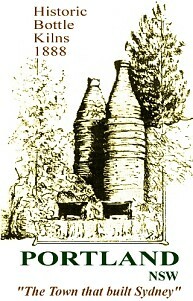 The Bottle Kilns are the remnants of the early Cement making process. They were built in 1888 and were the first cement making kilns west of the Blue Mountains. The Bottle Kilns are subject to a preservation order and are located on the northern edge of the Cement Works. While in Portland, you can take a leisurely stroll along the Williwa Creek, enjoy a picnic or simply relax in the quiet and peaceful surroundings. The Portland Town Common has 650 acres of natural bushland and picnic areas and is ideal for bushwalks. In fact, Portland is one of very few country towns left with a Town Common. A recreational area for anglers. Artificial fly and lure fishing only from shore areas and only between one hour before sunrise to three hours after sunset. Mt Piper Energy Expo and daily tours of the Power Station. State of the Art in Power Generation. Enjoy the hands on high tech interactive exhibits at the Information Centre. The Energy Expo is open every day from 9am - 5pm. Features include: video and static displays and is located in a lovely landscaped setting. Facilities include a picnic area with children's playground, BBQs and amenities. Tours of the power station are held every day (including weekends ) at 11am. Solid enclosed shoes must be worn and cameras and bags cannot be taken along on the actual tour. Groups and schools can book in at different times by prior arrangement. Sunny Corner, surrounded by large tracts of pine forest, is a small village located 14 km south-west of Portland or 7 km off the Great Western Highway (turn off at Meadow Flat). Sunny Corner started out as a goldmining town around 1860. A post office opened here in 1862 followed by a police station and school. There were over a dozen crushing machines in town at the peak of the goldrush. The Winterton silver reef was discovered in 1881 and NSW's first major silver-smelting operation commenced here in 1884. By the following year there were 768 men working the mines which, all-told, produced silver to the value of 891 000 pounds. The township was gazetted as Mitchell in 1885 but was renamed Sunny Corner in 1887, although the school was known as Mitchell School until 1899. The state's first School of Mines and Industries opened here in 1886 but closed due to lack of public support. The last mine, employing 100 men, closed in 1896. Operations were briefly resumed from 1917 to 1922 due to high silver prices. Reafforestation began in 1946 stimulating the development of a local timber industry.